Genet, Edmond Charles (1763-1834) French Diplomat: Edmond Charles Genet was born in Versailles, France on January 8, 1763. His father was an important foreign-office diplomat, and young Genet entered the diplomatic service at a young age. Through his connections at court, Genet became First Secretary of the French legation in St. Petersburg, Russia, at the age of 24. When the Girondists assumed power in France in 1792, Genet joined their cause, and was appointed Minister to the US. The French government, in the middle of war with Britain and Spain, did not want the US to enter the war, but did want some assistance. Thus, Genet was instructed to outfit privateers and organize expeditions to free Spanish-held Florida and Louisiana. Genet landed in Charleston, South Carolina, on April 8, 1793. He began outfitting privateers, as per his instructions. On his way to the national capital of Philadelphia, Pennsylvania; he received warm greetings from the public. He made the mistake of believing that the public response and the francophilia of the Jeffersonians meant more than it actually did. Thus, when President Washington asked him to stop outfitting privateers, he defied the President, threatening to go directly to the people for support. In August of 1793, Genet having assumed too much, Washington requested that he be recalled to France. 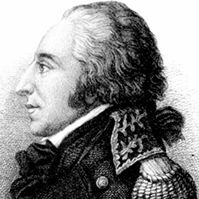 Although Genet's actions did relatively little damage, they did result in a greater divide between the Federalists and the Democratic-Republicans. The new French Minister arrived in the US in February of 1794. Instead of returning to France and answering to the arrest order from the Jacobins, Genet remained in the US for the rest of his life. He married the daughter of New York Governor George Clinton; settled on a farm near Albany, New York and became a US citizen. He died in Schodack, New York, on July 14, 1834.